Adele is approximately 6 years old. We just adopted her in January, but she is truly already a member of the family. 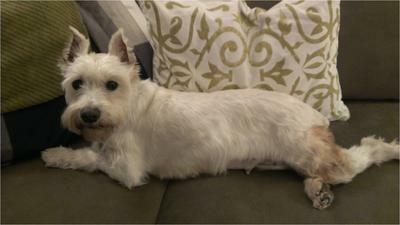 We adopted her from National Mill Dog Rescue, where she was rescued from a horrible "Breeder's Dog Auction." 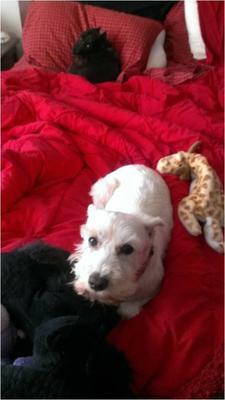 She had been given up (trying to be sold) as she had been a breeding dog twice a year since she was 6 months old. She had previously lived her life in a small cage, with no love, no exercise, and was almost emaciated. She had lived in hell for 6 years! When we met her she had never learned to be a dog. She had suffered two hernias from all her litters, some tooth decay, and has muscle atrophy. 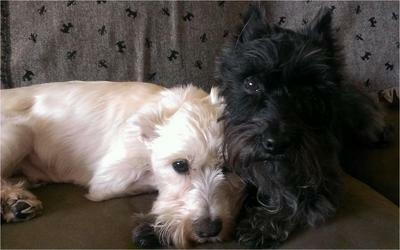 She was so weak her big brother Mason (our other mini schnauzer) has had to teach her how to be a "real" dog. She seemed like a puppy in an adult body! She now knows how to walk up and down stairs, jump up and down off/on the couch/bed, walk on a leash, stand on her hind legs, and even how to bark! She is still learning how to be part of her loving family. Adele is such a special little girl. She's learned to be trusting of us and other dogs. 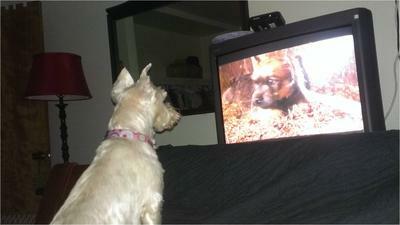 Her favorite show is "Too Cute" on Animal Planet. She just loves watching and hearing the puppies and kitties. She has such a loving motherly nature to her. This is one special pup! Adele is such a pretty white mini. I LOVE the idea of having one white mini and one black!